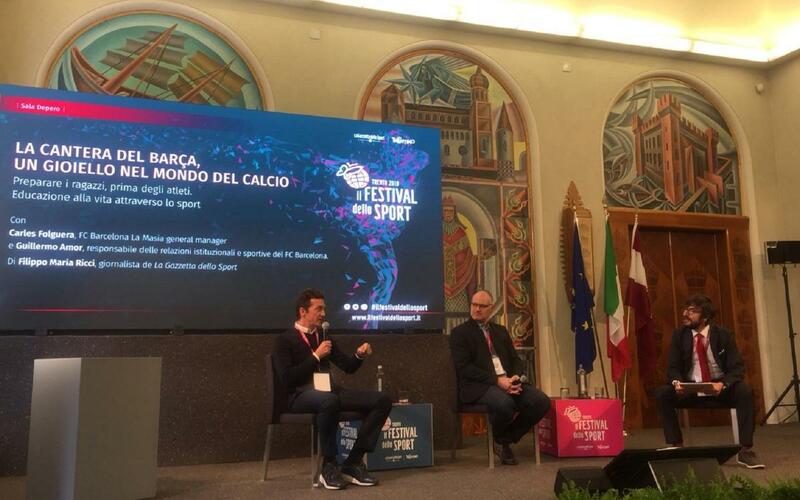 FC Barcelona’s famed La Masia and Barça’s youth development system were one of the main topics of conversation this weekend at the Festival dello Sport, a meeting organized by the Italian sports newspaper La Gazzetta dello Sport in Trento, Italy. The event was attended by some 150 distinguished guests from different areas of world sport, including Manchester City manager Pep Guardiola and Napoli head coach Carlo Ancellotti, the eight-time NBA All-Star Steve Nash, and 2012 Tour de France winner Bradley Wiggins, among many others. FC Barcelona’s representatives were Guillermo Amor, who played 11 seasons for Barça from 1988 to 1998 and is now the Club’s head of Professional Youth Football, and Carles Folguera, a former Barça roller hockey player who is now the Director of La Masia. Amor and Folguera explained not just football at La Masia, but the educational process there as well, under the title of "The Barça youth academy, a gem in the world of football."